Images with an ST 5 attached to a 7 inch refractor. Top left a RGB assembly taken between 4:36 and 4:58 CET, blue part with 10 minutes, green four minutes and red two minutes. Top right a false colordisplay of the image below, false color choosen to show the extent coma and the beginning of tail development. 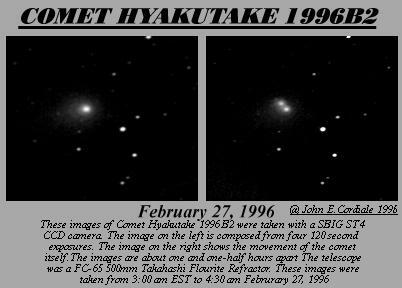 Image at bottom was taken at 4:20:20 CET with six minutes and has been log scaled for a close match to the comets visual appearance. All images taken at 1000mm focal length, automatically added bei Traccum mode. 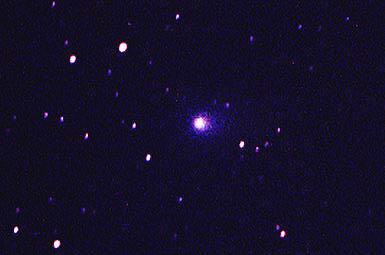 Bad seeing, was comet only five degrees over the rooftops to the south. 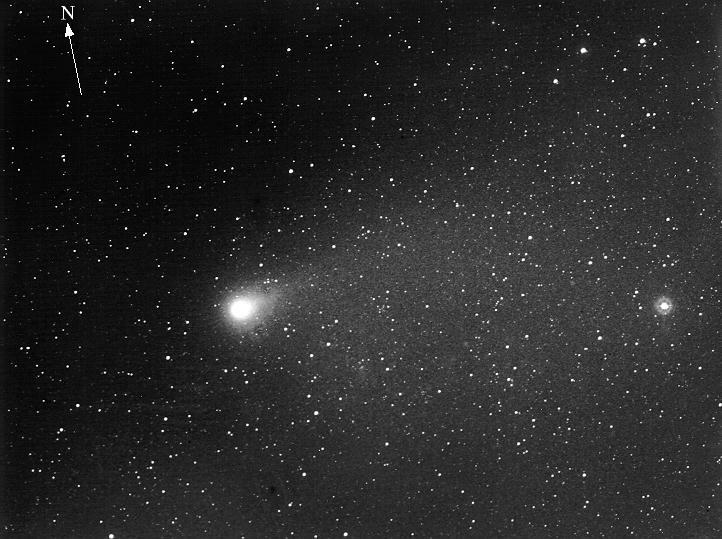 Images taken with a 6" F3.3 Astrograph on Royal Gold 400 20 min. exp. 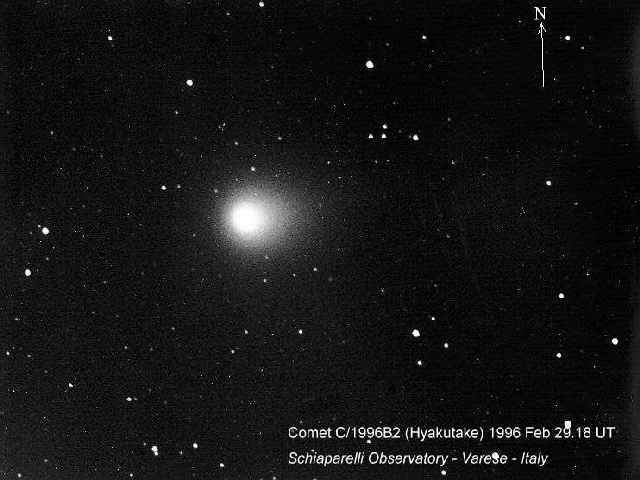 tracking on the comet. 8" f1.5 Schmidt Camera (300mm FL) hypered TP2415, 4 min exposure. 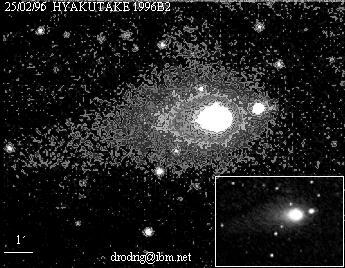 Exposure 120 seconds, Kodak based CCD in 2x2 bin mode, through a Takahashi 16cm f3.3 reflector. 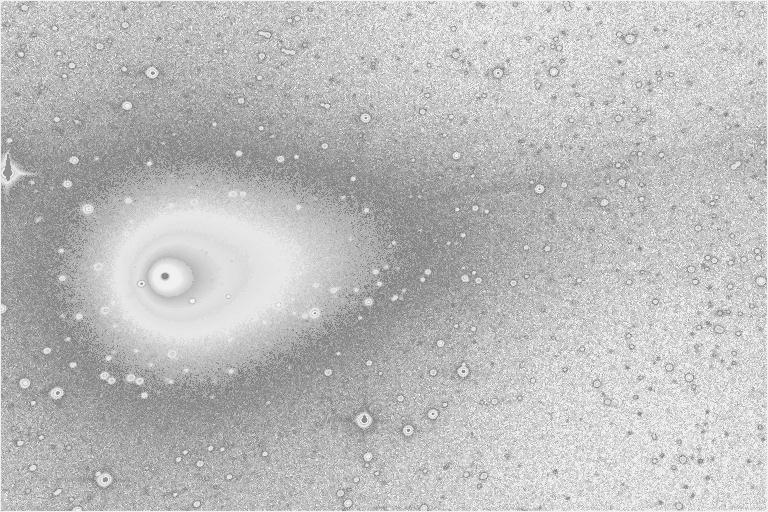 The scale of the image is 45' x 30' and the grayscale has been stretched using histogram equalisation. 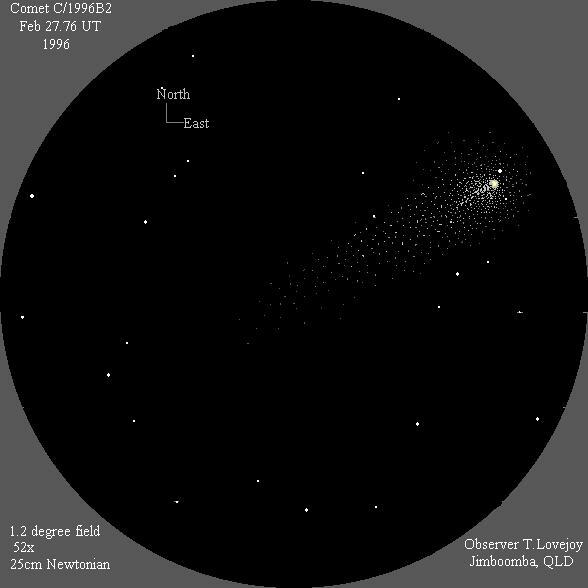 The comet is 1.61 AU from the sun and 1.00 AU from the earth. 300 sec exposure 1996. North is up in this 23' X 15' field. The image has been solarised and very high contrast settings applied to show inner and outer detail in the coma and the very thin faint gas tail in approx. PA 280. This tail extends for about 10' from the edge of the coma and has a slight kink ( possible DE ) about half way along. 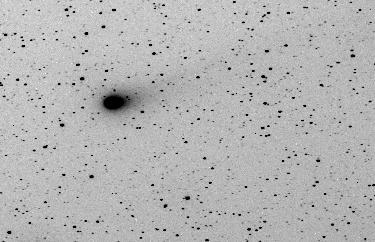 Taken with a 25cm f/4.1 Newtonian and HI-SIS 22 CCD. camera: our original(handmade) CCD camera "LA-2". telescope: 16cm f/4.8 Reflector(with reducer). A colour image with the 40 inch telescope. 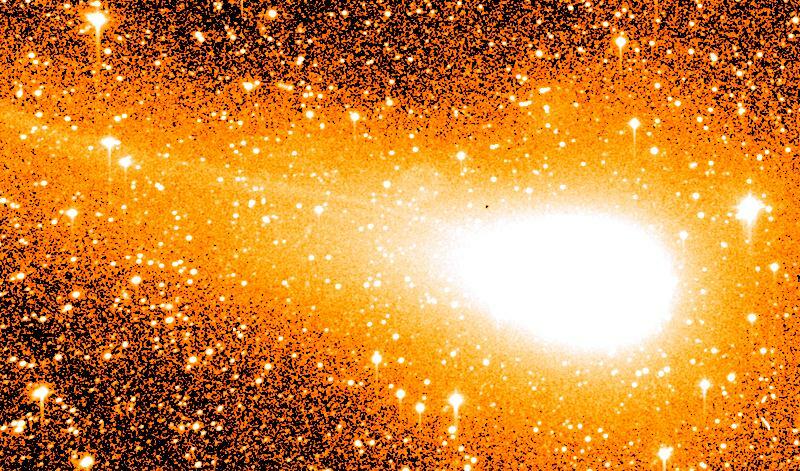 The ion tail is clearly visible, stretching towards the top left of the image. 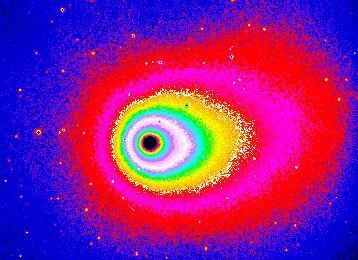 The turn-on of the ion tail (this is the technical term for this event) occured only one week previously. 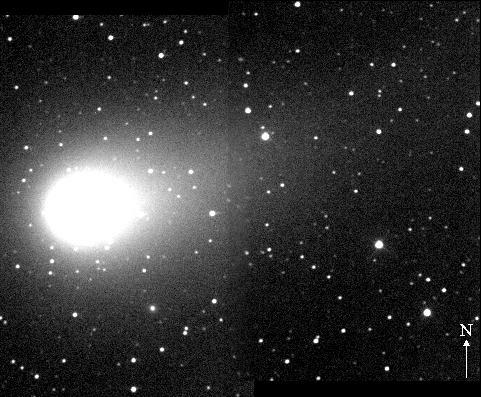 The image is 28 arcmin X 17 arcmin and is a combination of a 60 second R band exposure, an 80 second V band exposure and a 100 second B band exposure. 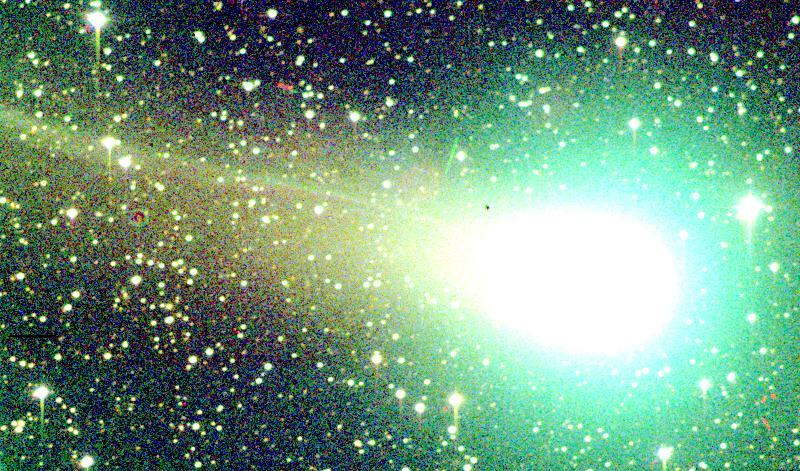 The magnitudes of the comet are approximately R=7.6 and B=7.5. The 60 second R band image showing detail in the tail is available. 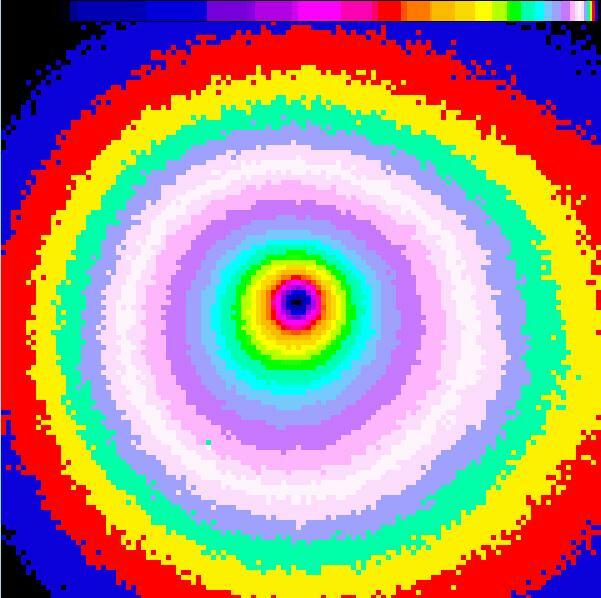 Tricolour image- 60 sec red, 360 sec green and 400 sec blue images at 18.37, 18.41 and 18.49UT respectively on Feb 25 1996. North is up Taken with a 25cm f/4.1 Newtonian and HI-SIS 22 CCD. 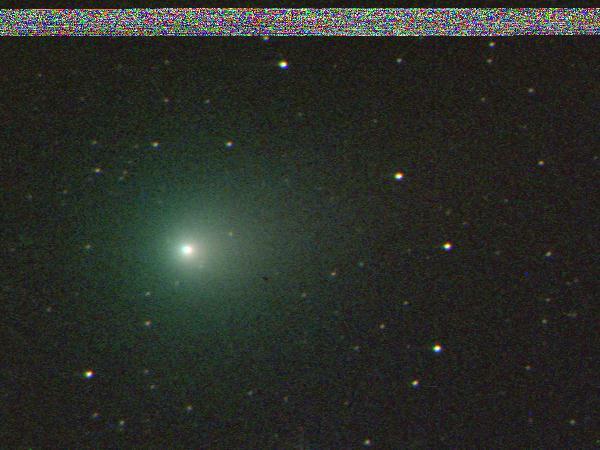 Two 90sec unfiltered CCD frame taken with 15 cm L F/4.short tail extending 15 arc minutes from central cond. PA 195; some other jetlike condensations seen. There was a star in the center of the coma. good conditions. 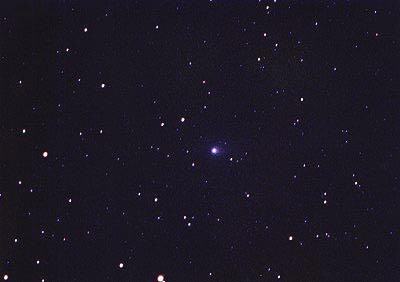 This is a mosaic of two exposures of 180 sec with CCD Hi Sis 22 and Newton 0,5 m f/3,8. 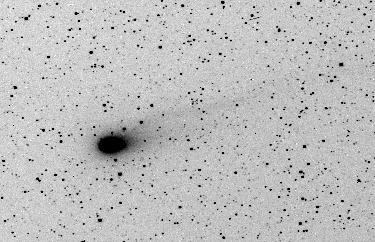 This 300s exposure was taken with the 20-cm, f/2 Baker-Schmidt camera, V filter and ST-6 CCD. Exposure started at 3:47:36UT. There is large ellipsoidal coma ~20'x25' and ~1deg faint tail in PA ~290o. See also the 180s R-filter image, obtained at 3:54:47UT with the same instrumentation. A 0.49-m Newtonian and an SX camera was used. North is up. CCD image using a FC-65 500mm Takahashi Flourite refractor and a ST4 CCD camera. 1.2 degree field. 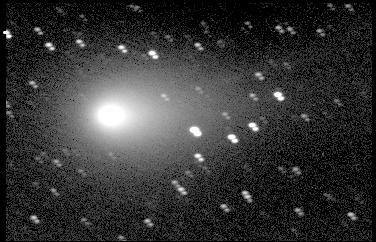 Image taken with a 25cm Newtonian. North is up. 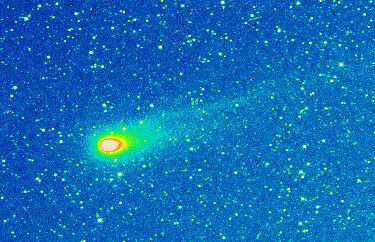 This false color image of comet shows a trace of ~0.8o weavy ion tail structure, extending in ~PA 290o. 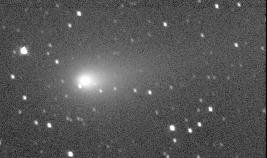 It was processed from the 300s R- filter exposure, taken with the 20-cm, f/2 Baker-Schmidt camera and ST-6 CCD. You may also see the W-B negative of this image. 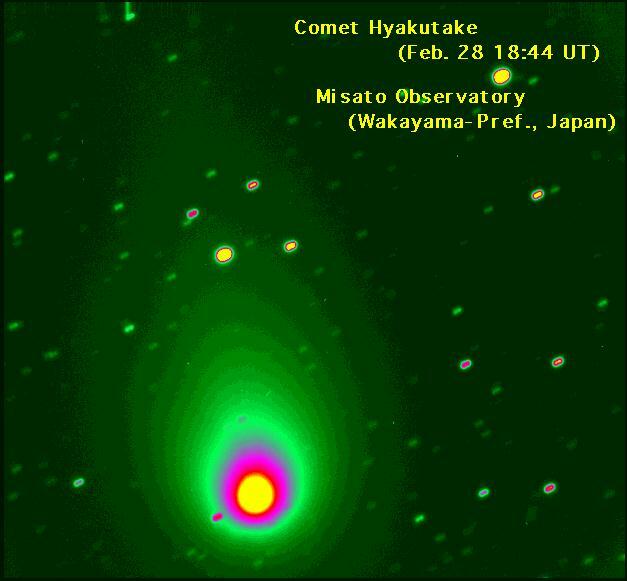 This is the most detailed image so far obtained of the complex tail system of Comet Hyakutake. 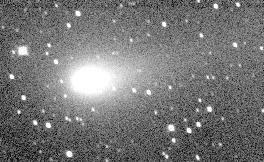 It was obtained with the ESO 1-m Schmidt telescope. The exposure lasted 60 min and was made on sensitized Kodak Pan 4415 film behind a GG385 filtre. This emulsion/filtre combination allows to record a broad spectral interval (3900-7000 A) whereby faint structures are better seen. The field shown on this photo measures approx. 2.25 x 1.39 degrees. North is up and East is to the left. 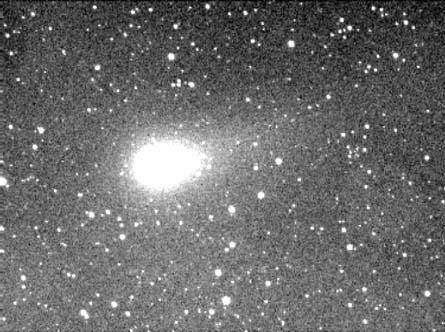 Image obtained with 1.05-m telescope and AstroCam LN2 cooled CCD camera (1242 x 1152 pixels) with R-band filter. Exposure time: 2 minutes x 4 frames. 120 sec exposure. 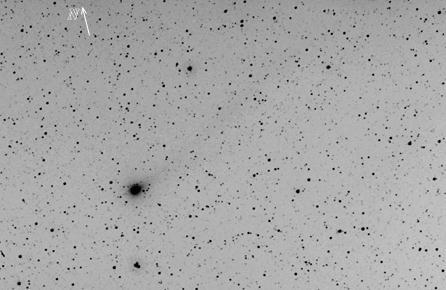 North is up and 46' X 35' field of view Taken with a 10cm f/6.4 refractor and ST-6 CCD. Image taken with a Celestron 14 Schmidt Camera (focal length of 600mm and an aperture of 350mm). 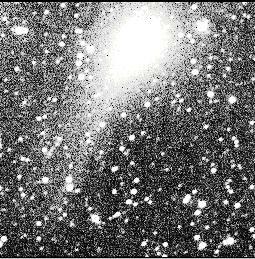 Hyperized Kodak Tp 6415 film.Time of exposure 5 minutes.The picture has a field of 20'x 45'.The bright star near the comet is SAO 182857. 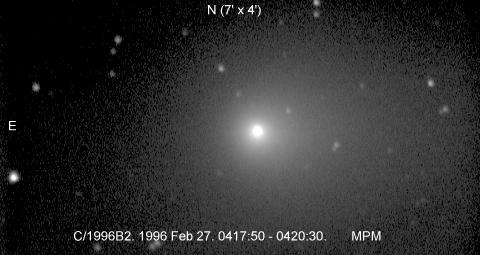 The magnitude extimated with a 20x80 binocular is 6.3.Coma has a diameter of 17'. No tail has been detected with this instrument. 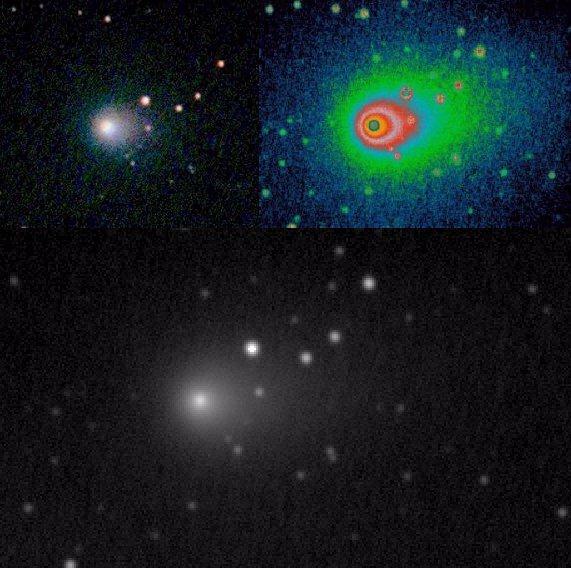 These false-colour images are reproductions from a short-exposure CCD frame, obtained with the Danish 1.54-metre telescope and the DFOSC instrument with a 2052 x 2052 pix Loral/Lesser CCD. 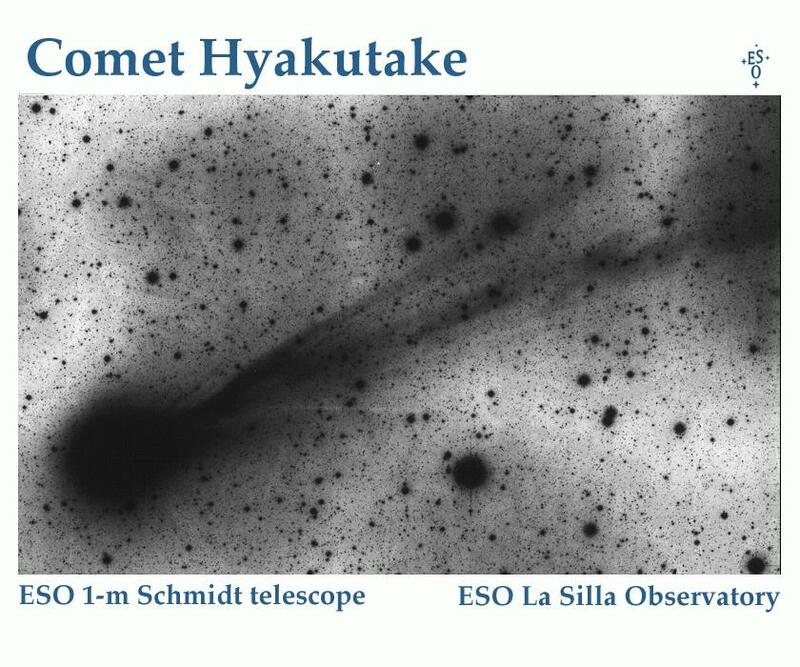 They show the innermost coma of Comet Hyakutake and the pronounced asymmetry of the dust distribution around the nucleus. The exposure lasted 60 seconds and was made through a red filtre (R). The sky condition was not optimal and the seeing was about 1.5 arcseconds. The pixel size is 0.39 arcsec and the original frame covers an area of 13.3 x 13.3 arcmin. On both photos, North is up and East is left.